I have been fortunate to visit dozens of golf clubs over the past few months, giving talks/rambles about golf and travel and promoting the Scotland book (thanks to all of you who have purchased, read, gifted, not borrowed A Course Called Scotland–the response to my latest links jaunt has been humbling). I encounter a few questions more than others: “How did you pay for all this?” “Who made your tee times?” “Can your wife talk to my wife, please? Seriously. Please?” and I’m usually ready with some sort of rejoinder. I stumble, and try to hide that I’m stumped. I’ve played some fancy and fantastic courses over here, but I know golf in Ireland and Scotland far better than I know it in my own country. The courses I see in my sleep–they’re all over there, nestled between sandy peaks and covered in wind-bent grasses. So when contemplating my next golf adventure, the destination grew obvious. Thanks to all of you who suggested Australia, New Zealand, Canada, South Africa, and the Democratic People’s Republic of Korea, but there was no doubt where I was headed, and where my next education lie: I was standing on it. A Course Called Home: Searching the States for the Great American Golf Course has actually been on my mind since an Irish friend wrote to me years ago, inquiring about his upcoming golf trip to America. He was eager to play the courses he had watched on television–Riviera, Hazeltine, Shinnecock were on his list, and he wondered if he could play Merion in the morning and make it to Oakmont for an afternoon eighteen. I procrastinated in writing back to tell him that Pennsylvania was larger than he was imagining it; not that it really mattered, anyway. It was hard to explain to him that he would come all the way to the States, and not have the chance to play a single course on his bucket list. I tried to lighten my reply with lies about all the great American public courses he might sample—the ones I knew were, in truth, far-flung and expensive—but my message back to him boiled down to a rejection letter of two words: Good luck. My travels had taught me that the golf course was a place where cultural differences and language barriers melted away around a common pursuit of par. Yet there remained conspicuous differences between the way they played over there and we played over here—small things, like shorter flags and no halfway houses and distances measured in meters—and then large things, and largest of them all, the thing I could not explain or defend to any Irishman or Scot, was our in-hospitality to visiting golfers. To folks from where the game was born, from the land of Muirfield and St. Andrews and Carnoustie—all revered courses happy to welcome visitors with credit cards and a handicap—nothing about our gated country club model made sense. And the farther I traveled, the less it made sense to me as well. And then I remembered–I didn’t have a scooby what I was talking about. What did I really know about golf in America, its destinations, its visitor-friendly experiences? Precious little. But thanks to my wife, who will once again be nominated for beatification this summer, that is set to change. In A Course Called Home, I will go searching for genuine golf experiences akin to the open, affordable, locals’ golf I have so admired around the world. I will also dig deep into the history of golf in America by begging/praying my way on to every course to ever host a US Open, along with the founding clubs of the USGA. I’ll visit every course to even resemble a links in America, to settle my own inner-debate about true links courses on this side of the Atlantic. I’ll play our westernmost, northernmost, southernmost, and easternmost tracks–from Alaska to Maine, Florida to Hawaii, I am determined to discover America’s most unique and inspiring golf revelations, and to locate the true American golf course. Doing so will of course require me to figure out what American really means to us in 2018–no simple task during these divided times–but in teeing it up with folks of every color, creed, and political persuasion, I hope to figure it out on those spaces of universal accord: our nation’s tee boxes. I share this news of the new book (look for it from Simon & Schuster in 2021–these things take some time) not to stir envy; rather, I ask you to channel any simmering resentments into your own efforts to push this adventure forward. Suggestions for courses to add to my list are most welcome; offers to host me at a course and help me avoid bankruptcy before crossing the Mississippi, even more so. This course needs characters, so I invite you to join the story. If you are in Maine, I cannot recommend Belgrade Lakes strongly enough. A phenomenal course layout and staff that treats you like a member no matter what. Open to the public, always in perfect shape. Seven Oaks Golf Course, at Colgate University. Open to the public, one of Robert Trent Jones’s first designs. The drive there will remind you of County Clare. And you can have a free place to stay and a guaranteed foursome. Can’t wait to read once you’ve completed your US tour! Hampton Hall in Bluffton S.C.
Have fun planning and playing, and be sure to include the Tao of Garth for a few rounds! Let me know when you are planning to head to Washington State. I now reside in Ponte Vedra Beach, FL but lived in Washington my previous 30 years of life and would love to join you if it works out. Also, your experience at Chambers Bay will be drastically different than what you witnessed for the 2015 US Open. The views in-person are unreal, the grass is green and they have recently undergone an effort to change all greens to poa annua grass. Good luck with your adventure and I hope to hear more as it unfolds. If you need a stopover between Tulsa and Dallas, I would be happy to host at Twin Hills Golf & Country Club in OKC. Another great Maxwell track with a lot of history, founded in 1923. It can be a stiff walk, but it’s a lot of fun. Hopefully you can play the Honors Course in Chattanooga or The Golf Club of Tennessee just outside of Nashville. I am happy to host you at Old Natchez Golf Club in Franklin, TN. Can’t wait to read the book already! Missing Blackwolf Run in Kohler, site of Women’s USOpen (Pete Dye) and Ozaukee Country Club in Mequon (Milwaukee, WI), site of the 1929 Western Open (when it was considered a Major). Tommy Armour winner, Hagen, Sarazen and Cruikshank in the field. Langford & Moreau design. Tom, you need to put Forest Hills Golf Course in Augusta, Ga on your list. It is a Donald Ross course where Bobby Jones won the Southern Amateur in 1930 to begin his Grand Slam year. He said his best golf that year was at Forest Hills. It is a public course owned by Augusta University and is the school’s home course. Tom: if you’re going to Onwensia on the North Shore of Chicago you must add Shoreacres and Old Elm. Great history with both courses. I can help with both. Gotta check out Common Ground in CO.
Is Arcadia Bluffs on the list? The just added the south course which is a hoot. Nevel Meade Golf Course is 10-minutes from my house. Let’s tee it up! 30-minutes away is Chariot Run Golf Course in Indiana. Might want to check it out. Tom, I am the VGA State Director for PA, Would love to have you at Royal Manchester Golf Links near York, PA, We can invite Aaron, the Dog and Tim Robinson for the foursome. They take care of us vets there and its a fantastic course and layout. Thank you would love that! Will circle back when the itinerary comes into shape. Much appreciated! Thanks again for this recommendation — can we set this up for July 1 possibly? Would love to join you and Aaron and Tim. Thanks! You have to visit Atlantic City CC, where the term “birdie ” was hatched and that has one of the most nostalgic locker rooms anywhere in the country. Hey…it is just a morning bike ride from Broad Street ( well, maybe a short car ride ) that you could do anytime when opportunity strikes. Well worth the visit. Tom … just Tweeted this to you. Pls add AZ Nat’l Golf Club (Tucson) to the list. Gorgeous/challenging RTJ course. Coming back from the brink. A++ design, A+ staff, B+ condition. Played twice while there on business … looking for an excuse to go back! Though it might prove an insurmountable challenge to fit into your itinerary, please consider Gamble Sands, a David M. Kidd links-style course in Central WA, on the Columbia River. BTW, my boss, the Director of Golf at Chambers Bay, is on-board with your visit this summer! Looking forward to looping for “The Legend”! Azalea City Golf Course has been serving the citizens of Mobile, Alabama for over 60 years.Designed by notable architect Robert Bruce Harris, Arnold Palmer and other well-known golfers have enjoyed playing here. This course was once recognized by “Golf Digest” as being one of the top thirty-six public courses in the U.S.
Azalea City is the first golf course I took my son, Patrick to at the age of two! Patrick grew up playing at Azalea City and your book “A Course Called Scotland” was the impetus for an epic Father/Son golf trip that Patrick and I recently took to Ireland and Scotland. We would love to host you for a round at Azalea City and at our house in historic Mobile. Thank you! That would be great. Stay tuned as I update itinerary and will try to fit azalea city in for sure. Rolling Green in Springfield Pa is undergoing a Renovation. Of course you are familiar. My husband and I traveled to Wisconsin last summer. We played the Irish course at Whistling Straits and the River course at Blackwolf Run. I would highly recommend. If you want to play locally, we play at Makefield Highlands GC in Yardley, PA. Usually in great shape and staff is friendly and helpful. I just finished reading A Course Called Scotland. I like it even more than I like Ireland. Thank you! I appreciate the recommendation and the generous invite! 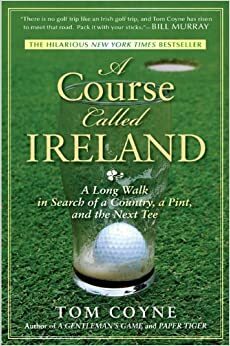 I have never been one who enjoys reading, until I came across “A Course Called Ireland” shortly after I returned home from the Emerald Isle in 2017. Since then I have read (and purchased!) all of your books and cant wait for this one! I was excited to see you have Waveland Golf Course in Des Moines, IA on the list. Fun fact about Waveland, it is the Oldest Municipal Golf Course west of the Mississippi! Living a full 5 minutes away from the course it is where I play most of the time in Central Iowa. It is loaded with blind shots over rolling hills and timbers. There are a few other courses in Des Moines that I would recommend if time allows. Tournament Club of Iowa is an Arnold Palmer designed course and a very reasonably priced public course. I would also toss in The Legacy (in Norwalk just south of Des Moines) and Otter Creek in Ankeny (an Iowa attempt at a Links style course). I would be honored to host you in Des Moines if needed, as well as join you for your walk around Waveland! Good luck with the adventure and cant wait to read about it! I live in the Bay Area and would absolutely love the chance to play Bodega or Harding with you, and if Northwoods is the 9-hole in the Russian River designed by Alistair Mackenzie than obviously i’d make time as well. I’m especially curious about your thoughts on Harding because I think it’s completely overrated and pretty uninspiring, but your views on it might change that. How can I do my best to join you on one of these outings? Thank you! Would be great if you could join me. Follow @coynewriter where I’ll be posting dates as they come together. California is looking like December…thanks for reading and reaching out. I tried to leave this before, but let’s try again … I live in Northern California and would be absolutely thrilled and honored to play Bodega, Northwoods or Harding with you if you have space in your group. I’m especially intrigued by your view on Harding which I find horrendously overrated (especially for the price) and feel the opposite about Bodega and Northwoods which I think are really hidden gems. Hi Tom – I would love you join you at any of the PA gems that you have listed (Conocodell, Cobbs, Lulu) as you are passing through. I saw someone mentioned Royal Manchester which is actually my “home” course so I would recommend that too! Looking forward to reading more about your travels and hearing you on TGJ podcast.